Meaning, "bear" of the animal variety. Scent: sulfur, clove & sandalwood. Voice: Clive Standen as Rollo, from Vikings. The ground quakes as the beast moves over the lands; the wind soars wherever he flies; the trees part as he so gracefully, yet so sullenly, walks through them. You would truly have to be blind to miss his towering presence, although even then you'd know he was around. He holds a massive frame of muscle and flesh; his bones thick and dense. Björn measures out at an impressive twenty hands tall, the majority of his hide a deep ebony hue with few splashes of pure ivory. His under belly to his groin and hips were splattered ivory, along with spots among his throat, covering his entire facial features and fading out behind his ears, halfway down the back of his neck. He sports a goatee that was near six inches long that was a ghostly white. In the black of night, you may just see the hints of his ivory peeking through the darkness, but what you will always see is the neon red circles that are where his eyes are; like the fiery pits of hell. They have no pupils, they're just balls of fire. He has thick ebony circles around his eyes that cause him to appear to have makeup on, causing the red to only stand out even further. Looking into them, when he allows you to, you can just feel the amount of pain and chaos he has felt in his past. However don't go staring into his eyes for too long, or he'll meet your gaze with his sharp, shark-like teeth as a warning. Teeth made only for tearing flesh, a strict carnivorous diet. The only one he has ever known. While his extremely lengthy mane was of only ebony, which flowed elegantly in the wind like a God; his tail was another story. No hair, only a mix of scaled hide and smooth dolphin-like skin. It was long, near six foot and it came to a very sharp, arrow head tip. The mass of his tail was thick. 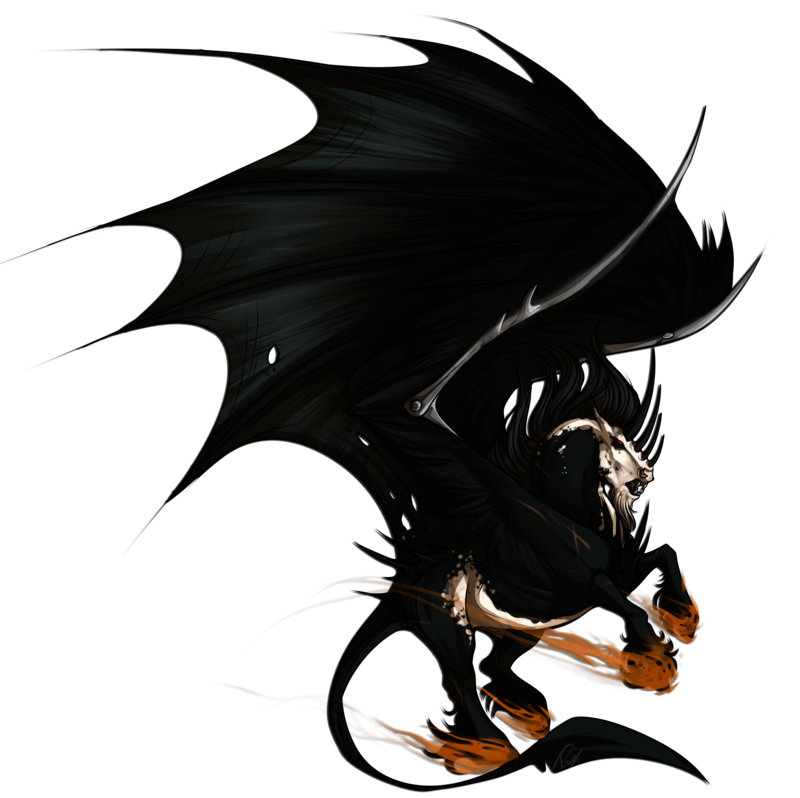 Along with his sharp tail, came the spikes of black bone that grew outward from his rear and out from his broad chest. Spikes of a warrior; matching the four spikes along the ridge of his nose. Björn was a bred, born, raised warrior. A killing machine, ready to destroy and send everyone he faced to Hades. 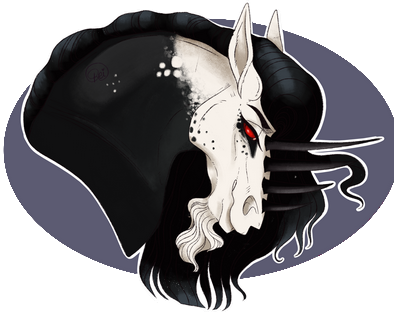 Hooves the size of many other's skulls. Ebony feathers clung to his lower legs, shielding his feet. He has the ability to summon flames to burn at his feet, giving him a intimidating feel, however they are harmless. What else could this brute possibly possess, right? Well let me continue onto his wings. Having the wingspan of twenty two feet, the arches are of steel with two spikes near the middle. His wings are mostly the texture of a bat's, however they are feathered near the arches like a traditional pegasus. Within his recent travels, he had discovered his ability to seemingly melt his wings into his hide, making it appear as if never possessed his under-worldly set of wings. As expected with a man of his stature, Björn possesses a plethora of scars that riddled his hardened body. There were stories behind them all, but he'll more than likely never tell. Nowadays, he's just a mere ghost of the man he used to be. Not much more than an empty vessel. Or so it may seem. The years have certainly hardened him from the oblivious colt he once was, prancing about without a care in the world. From the beginning of his life, the weight of the world was thankfully shielded from him with many thanks to his older brother, Valor. He was able to live carefree and grow up semi-slowly; until his brother decided to leave their Khalasar, making Björn the new Khal. It was from that moment on he knew that it was time to grow up and that he did. Now being the leader of a massive group, he did what he had to, to provide and keep them safe. But it wasn't long before he left on a journey to find his brother, which little did he know would open up an entire new world for him. Indeed he started off as a playful, carefree creature who ruled as second along side Valor, once he had found him, he was the reasoning to his brother's madness. Always whispering in his ear the reasonable way to handle things... but many life events happened since. Embarking Björn's change. Within his journey, the overo beast became a sullen, silent being who wandered the world in his own company. He wasn't much for words, which many would find very off-putting, all that did was work in his favor. He had a very eerie feel about him, with his fire pit of eyes and the silent way he moved, it wasn't often that many lingered near him. Most would say just by looking at him, you could tell that he was miles away in his own mind, than being right there physically with you. So that being in itself, makes Björn a very complicated case to crack. Even most days, he has a difficult time figuring himself out. He most certainly is not happy with where he is in life, but he has forced to come to terms with how things worked out. Deep down he yearns for company, to be apart of something again, but he would never allow himself to admit it or even show it. Heartache has taught him it was better to remain alone than get himself caught up with anyone. Would he ever find someone to yank him out of his soul-sucking shell and be himself again? The beginning of his life was an abrupt and violent one. He was yanked out of his mother's birth canal while she was delivering him by his older brother, Valor, in a fit of rage. It was then in turn Björn's sire attacked Valor, causing his dam to leap and chase after his sire. Their mother was violently murdered directly in front of them both, right before Valor took it upon himself to end their sire's life. Within their tradition, it wasn't the next of kin who took over the Khalasar, as their sire was the Khal, it was up for a battle - and all kin of the former Khal must die. Valor had fled, leaving Björn's newborn body helpless and vulnerable. Many other males took it upon themselves to take the chance to trample the young colt to death while they could - they would of succeeded if Valor hadn't of stormed back and killed them all, taking over the position of Khal. That allowed Björn to grow up the way he was intended to. It was when he was the age of two, was when Valor took off, leaving Björn to once more fend for himself, however this time he was far more than capable. He took over being Khal through various of fights and he do so proudly. However, it only lasted a year. It was then he grew bored and left in search of his older brother. In the midst of tracking Valor down, he had gotten himself into trouble here and there, making his own memories along the way. It wasn't too long though, that he found himself entering the strange world of Elysium, which he soon after found his brother, who had just taken over a territory of his own, with a gorgeous female ruling at his side. Björn proudly stood by his brother's side, even despite all that had happened between the two, there was no where else he'd rather be. Blood was blood, family was the most important thing to him. Regardless of anything. Events quickly unfolded, which left himself in a very difficult place. His brother had gone missing, right after his then-pregnant Khaleesi had been attacked. It was later on he found out that Valor had challenged another - the Queen of the Woods. But she had also been pregnant at the time, in which no one had known. It had been a grueling battle, Björn had seen the after math. His dragon brother nearly died that night; in fact, he was pretty sure Valor had died that night. For after that, he was a totally different man. No one that Björn had ever known. It was then his brother fled once more, leaving him to pick up the pieces of his Khalasar, along with the pregnant Khaleesi. It was not long after that, when she gave birth. Thankfully, he had been witness to that... it was one of the happiest moments Björn ever experienced. All of that ended, nothing was the same and he ended up leaving his beloved friends and family, once more in search of his brother. This time in pure anger for what he had done. However, he never did find him after that. The trail had gone cold once he entered a place called Caeleste, in which he had aimlessly wandered for who knows how long, he couldn't even tell you himself. He continued on, letting go of his search for his brother... leaving a huge empty spot in his very being till this day. Now that he has stumbled upon Fimbulvetr... what will happen?